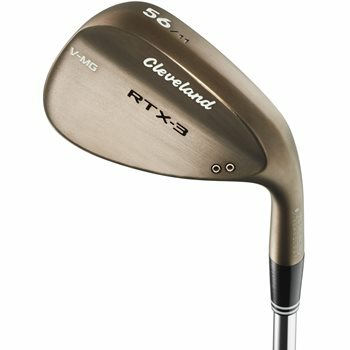 The Cleveland RTX-3 wedges combine Feel Balancing Technology, V Sole Grinds, and new Rotex Face to help you get closer to the hole, more often. The Feel Balancing Technology removes nine grams of mass from the hosel and redistributes it to the head of the wedge for a center of gravity that is closer to the impact zone to improve feel and to create the tightest shot dispersion of any wedge Cleveland has ever made. Tour proven V Sole Grinds feature a V shape with more leading edge bounce to help the club head through the turf faster at impact for a crisper feel and more consistent performance. The Rotex Face combines a refined groove shape, Rotex micro-milling pattern, and Laser Milling to generate the most spin and most consistent spin within the limits. The Tour raw finish rusts over time for a distinctive feel and cosmetic appearance and is the exact same finish used by Cleveland Staffers.